The current outlook for tropical cyclone formation is shown above from the NHC. The NHC forecasts 40 percent chance of development during the next 48-hours and 70 percent chance during the coming five days. 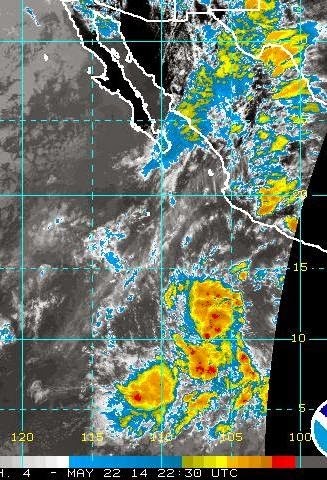 The next tropical storm that forms in the eastern Pacific will be named "Boris." The center has now begun issuing outlooks for the Atlantic also. Yesterday's "weather event" was certainly underwhelming. There were a couple of very slight sprinkles here at the house at in the early afternoon. 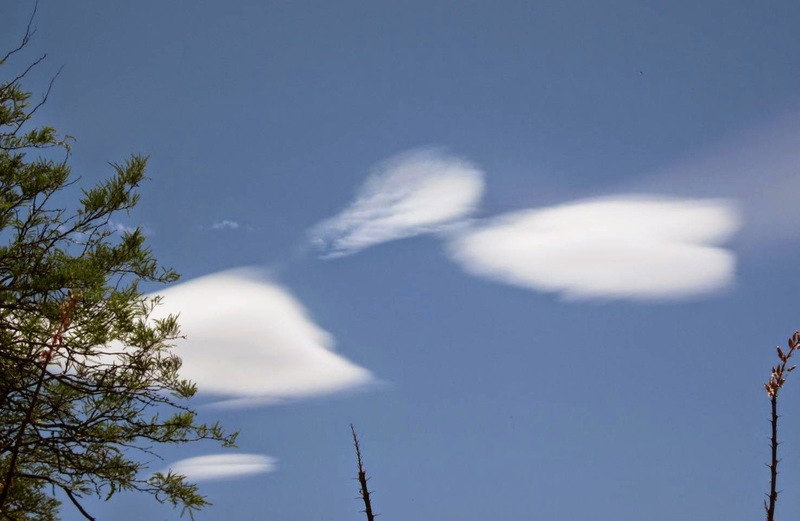 Cloud bands moved away to east by mid-afternoon, although several isolated thunderstorms developed late afternoon and evening, centered on the southwest corner of Pinal County. Above plot shows detected CG lightning flashes detected during the 24-hours ending at 5 am MST this morning. I checked for rainfall across all the reporting sites in southeast Arizona - found .04" at Nogales and Arivaca; 0.02" at Sasabe and Mt. Hopkins. That was it - looks like we will close out May here at the house with a Trace noted on 2 days. Yesterday's early WRF-NAM forecast turned out to be a pretty good outlook for the day. This morning there is a band of showers from south-to-north across east-central Pima County -These are moving toward the north and shifting slowly eastward. 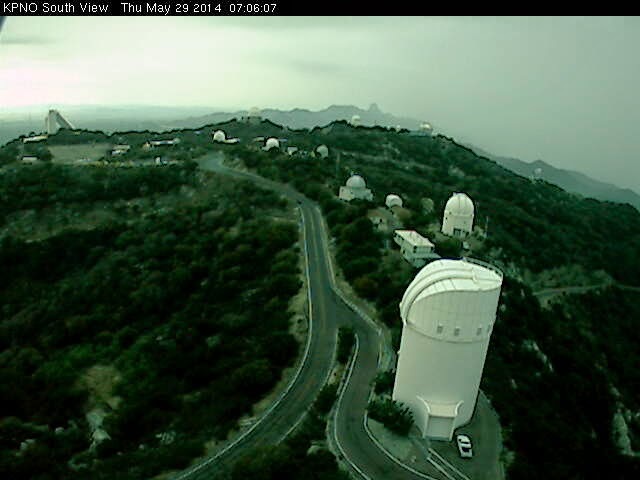 View from Kitt Peak to south a bit after 7 am MST shows some of the shower activity. The early WRF-NAM this morning has decreased considerably in the amount of shower it is forecasting for today. Rainfall forecast through midnight tonight is shown above. 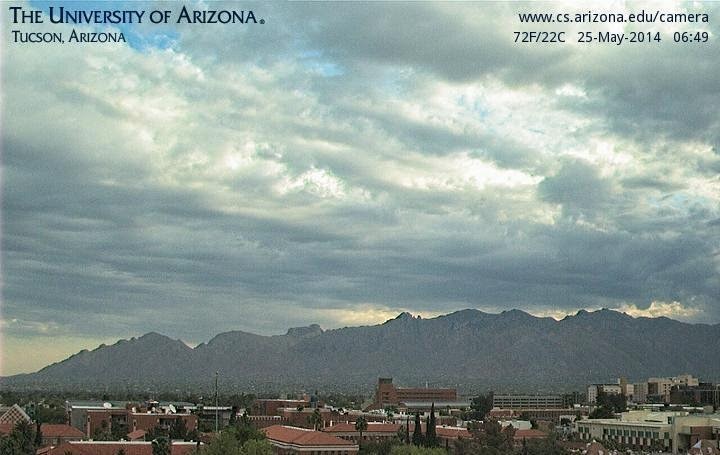 The Kitt Peak webcam seems to indicate heavier showers than the model forecast would indicate, so best course for today may well be between yesterday's WRF and this morning's. Main reason for the decrease seems to be that less CAPE is forecast for this afternoon - forecast below is CAPE valid at 5 pm MST today (Thursday, May 29th). Amounts of CAPE in the forecast are minimal to none. Upper-level winds this morning display considerable difluence over eastern Arizona, so there will be a large-scale field of vertical motion moving across our area during the day. First - I am trying to bring up a new Windows 7 PC and am struggling a bit. This is my first attempt to do a blog post using the new system. I seem to be able to use the new "snip" tool to capture more of the WRF forecast frames and show the color bars - which is a nice improvement! The above graphic is the WRF-NAM forecast from the 12 UTC run this morning of PW valid at 11 am MST tomorrow morning (Thursday the 29th), with the forecast made on the 5.4 km grid. The model forecasts precipitable water associated with Amanda moving northward and then breaching Baja to advect into Arizona. The forecast below is the same as above but on the 1.8 km grid - it forecasts PW to get a bit above an inch tomorrow over parts of Pima and Pinal Counties - this would be the highest PW value in quite some time. The MIMIC total PW blended analysis for noon today is shown above from CIMSS, Univ. of Wisconsin - note the broad plume of higher PW that has been advecting northward, west of Baja, from what is now TS Amanda. In response to the increased moisture and development of some CAPE in the model fields, the morning WRF-NAM forecasts several rounds of light showers and thunderstorms across southeastern Arizona tomorrow. The above is the forecast of composite radar echoes valid at 2 pm MST tomorrow afternoon. The forecast below is for total rainfall through 11 pm tomorrow night - again, the most aggressive forecast from the WRF for quite some time. Heat has returned to Arizona for next several days. High in Tucson on Memorial day jumped up to 97 F - NWS forecast for today is 101 F at the airport and 105 F tomorrow. The visible satellite image above is from 7:30 am MST today, Tuesday, May 27th. The smoke plume from the Slide wildfire in Oak Creek Canyon is at the center of the image. This fire is 25 percent contained as per the morning incident briefing. Also of interest is the bright white snow cover over the Colorado Rockies. The NHC 8 am MST time discussions say that Amanda is still a Category 3 hurricane, although its visual appearance this morning (above) is not very impressive. The latest forecast indicates Amanda weakening and moving north-northeastward until Friday, when the low-level circulation is forecast to detach from the midlevel vorticity - the low-level circulation is then forecast to move southwestward. Finally, I couldn't resist showing the global models forecasts for 500 mb valid out at 10-days (i.e., 00 UTC on 6 June). The ECMWF is above, while the GFS is below. While GFS forecasts a 588 dm anticyclone to be centered west of Baja, the ECMWF builds the high northward and forecasts a 594 dm anticyclone over west Texas. Summer definitely moving northward, especially in the European model forecasts. If this forecast verifies, that Colorado snow cover will be rushing down the streams and rivers. Heavy mid-upper cloud cover over the Tucson area this morning with some virga and very light showers to the northwest at sunrise - see above view of Catalinas and IR image from 1315 UTC below. There were some very slight sprinkles here at house with a hint of a smell of moisture in the air. Yesterday was very suppressed over most of southeast Arizona, as was forecast by the various WRF model runs at Atmo. The early WRF-NAM (below) forecasts some sprinkles over Pima county through noon, but again any rain with the 500 mb closed cyclone (now centered over northwest New Mexico and southwest Colorado) is confined to the White Mountains. 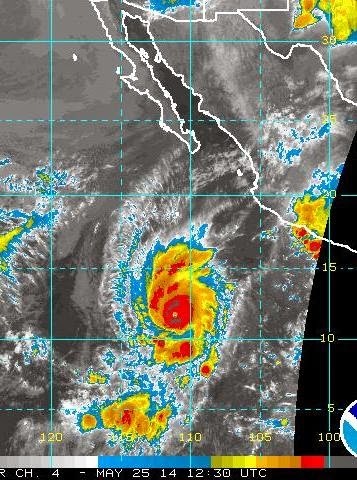 Edited to add: Around 8 am this morning Amanda became the strongest May hurricane ever observed in the eastern Pacific with maximum sustained winds estimate at 135 kt/155 mph - however, Amanda did not quite reach Category 5 strength. Amanda has intensified to a Category 4 hurricane with NHC estimating the maximum sustained winds at 140 mph and the central pressure at 946 mb. Amanda has become the second strongest May hurricane ever observed in the eastern Pacific - strongest was Adolph in 2001. Image above shows IR satellite image at 1230 UTC this morning (Sunday, May 25th), and below is water vapor image at 1300 UTC. Current NHC forecas (above) intensifies Amanda some during the day today as it begins moving northward; however, the intensity forecasts have not been very accurate with this storm so far. The global models have quite different forecasts for the evolution of moisture associated with Amanda. The ECMWF keeps higher precipitable water (PW) values at fairly low latitudes and then shunts them off to the west around day 6. However, the GFS ensemble continues to have members that forecast Amanda will initiate a GoC surge of moisture northward around day 5, i.e., Thursday to Friday. Confidence is low and careful monitoring is needed. The runs of the WRF forecast model today at Atmo have reduced the coverage of showers over southern Arizona for today and tomorrow. Graphic above shows total rainfall predicted by the early run of the WRF-NAM - the period runs through midnight Sunday. Note that only forecast for showers in Tucson metro area is for developments that move from the Catalinas east-southeastward. Currently there are showers and buildups on the Catalinas and the Rincons. The new, 12 UTC runs this morning have almost eliminated any forecast of showers over the entire southern half of Arizona, with only some very light showers moving off the mountains of eastern Pima County today. Meanwhile, the Slide wildfire continues to burn between Sedona and Flagstaff - map of fire from last evening below. The fire has burned more than 10,000 acres as of morning today, and forced some evacuations. It is only 5 percent contained. While winds will be lighter than last several days, they will be blowing from westerly directions rather than from the south-southeast. The fire is in very rugged terrain and difficult for firefighters to combat. Amanda has become the first hurricane of the 2014 season, in the eastern Pacific, this morning and is rapidly intensifying - current position shown above and current forecast below. Note that NHC now forecasts Amanda to quickly become a Category 3 hurricane. Visible image above shows Amanda at 7 am MST this morning. several of the GFS ensemble members are forecasting moisture from Amanda after 6 days or so - below is one of the GFS ensemble forecasts from 06 UTC last night that is forecasting a substantial influx of moisture into Arizona at 132 hours. Something to watch closely during the next few days. 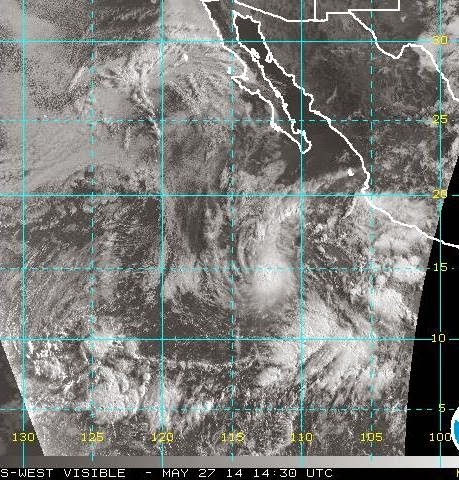 The NHC has named Amanda this morning, making it the first tropical storm of the eastern Pacific, 2014 season - see above. Below is a visible image of the storm at 8 am MST this morning. At the bottom is the current NHC forecast that indicates the storm becoming a hurricane by Monday morning. Above is the experimental run that Mike Luethold did using a lightning prediction algorithm in the WRF model (all lightning flashes are forecast). Graphic below shows all cloud-to-ground flashes detected during the past 24 hours, ending at 5 am MST this morning - the algorithm appears to have verified quite reasonably based on yesterday's CGs. Note also that early morning thunderstorms are producing lightning up in the White Mountains. This morning the run of the early WRF-NAM appears to have crashed. Above shows forecast of composite radar valid at 5 pm tomorrow (Saturday, May 24th) from the WRF-GFS. The GFS version keeps all storm activity today far to the north-northeast and to the west of the Tucson area. The GFS version did forecast the early morning storm activity to the north accurately. Below is the WRF-GFS forecast of total rainfall through 11 pm MST on Sunday night - meaningful rain on the ground is only forecast up in the Whites and Rim Country. Will check the new morning runs of the WRF a bit later today. The NHC has declared that the disturbance near 10N 105W has become a Tropical Depression - above is IR image from 2230 UTC. Visible satellite loops show substantial rotation, and I suspect that Tropical Storm Amanda has developed, or will shortly be declared a storm by NHC. Forecast above from WRF-NAM is for 10-m winds valid at 2 pm MST this afternoon - looks like more trouble for firefighters dealing with a number of wildfires across the state - particularly the Slide fire north of Sedona in Oak Creek Canyon and the Skunk fire east of Globe. WRF-NAM forecasts of composite radar echoes are shown here - above is valid at 5 pm tomorrow, May 23rd and below is valid at 6 pm on Saturday, May 24th. Main aspect of forecast is that fairly numerous, high-based thunderstorms will produce lightning, strong winds, dust, and some light rains tomorrow and Saturday (storms today will be mostly over the White Mountains and in New Mexico). Numerous strong thunderstorm outflows are forecast for tomorrow and Saturday - above is an example from the forecast for 7 pm MST on Saturday afternoon. Total rainfall forecast through 11 pm on Saturday night is shown below - amounts are mostly light but a few spots are forecast to receive from 1/2 to 3/4 of an inch - the light green areas. Several interesting weather days ahead of us and there will undoubtedly be some related problems across the state. 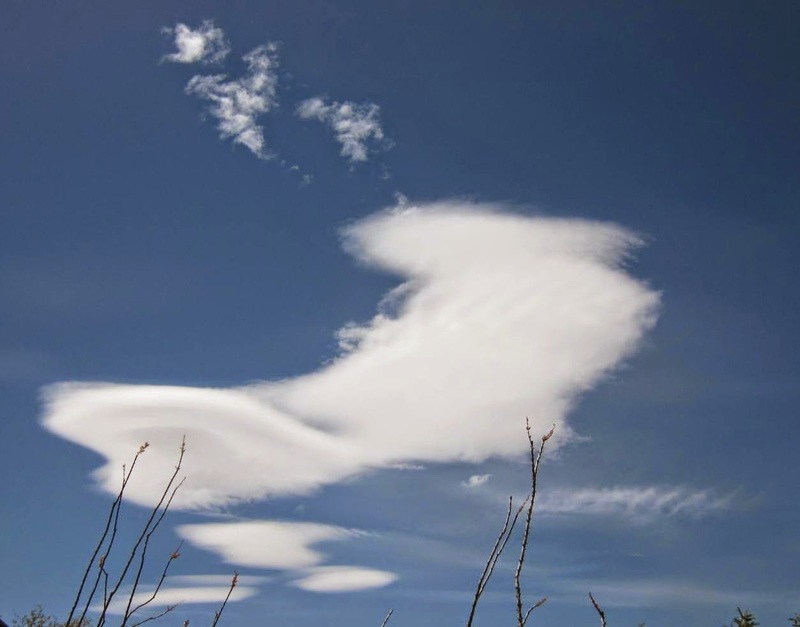 Numerous lenticular clouds were present yesterday afternoon - photos above and below from around 3 to 4 pm MST. A large supercell (above) in Colorado moved right over the NWS Front Range radar and continued eastward, producing several tornadoes and large hail. Photo below shows the storm approaching the Front Range Radar site (by Bob Henson, NCAR). 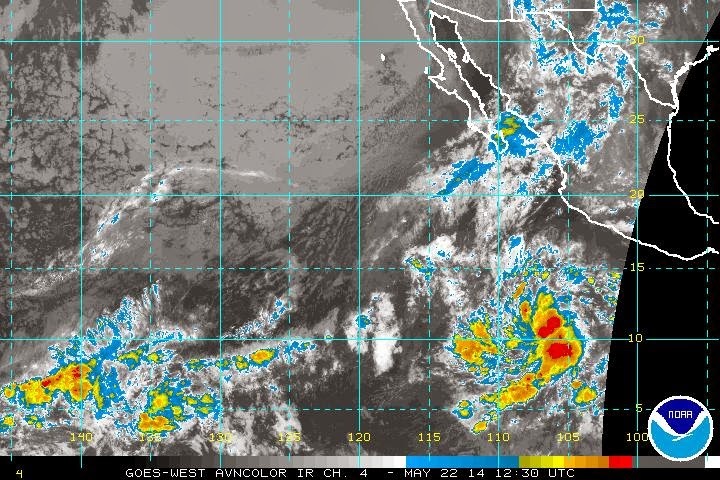 The NHC is forecasting a moderate chance that the cloud cluster circled above will develop into the first eastern Pacific tropical storm of the season. The probabilities given by NHC are 30% in the short-term and 50% out around 4 to 5 days. IR satellite image below is from 1230 UTC this morning. 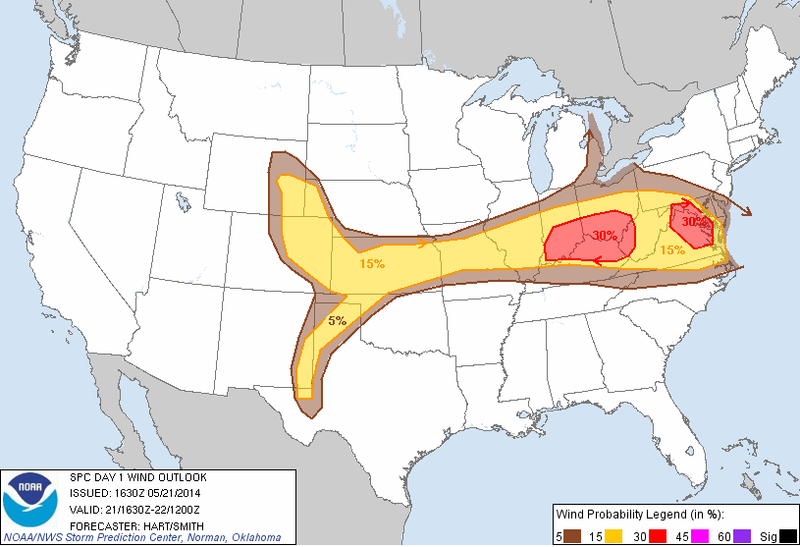 From Pat Holbrook in Idaho - SPC has chance of Sharknadoes today! Another weather problem is the risk of dust storms over central Arizona due to convective outflows. Both 6Z runs are forecasting quite strong winds during the late afternoon. The forecast he referred to is shown below and is valid at 4 pm on Friday afternoon, the 23rd. Note that there are at least 4 convective outflows in the forecast, from south-central Arizona and west to northwest from there to along the Colorado River.